We know that North Korea has a food, energy and transportation problem. We know that it can, theoretically, produce more food with more inputs of fertilizer, electricity, fuel and machinery, but that, for the time being, importing food would better reflect the North’s comparative disadvantage in agricultural production. We know that North Korea has abundant natural resources, that these are a potential source of hard currency and that a smart strategy would be to process these resources before exporting them. We understand the domestic constraints on reform that Kim Jong Un faces. For gradual and controlled development, which is preferred by the leadership so it can remain in power, reform would have to be a top-down process. The authoritarian leaders in Pyongyang must pay attention to a proper distribution of costs and benefits among family members, aristocrats and bureaucrats. The concept of “divide and conquer” has been practiced worldwide for centuries. The geopolitical situation is complicated but far from incomprehensible. The country faces an overwhelmingly powerful “friend” whose embrace is potentially suffocating. Remarkably, during my latest visit to North Korea in May this year, China’s decision to support United Nations Security Council sanctions was openly branded as betrayal. The US is seen as a global bully with a big stick, having shown no mercy to regimes in Afghanistan, Iraq and Libya, and recently displaying its might over Korea with military exercises involving aircraft carriers, Aegis ships and stealth bombers. Japan is suspected of dreaming about regaining lost territory. South Korea is seen as a once-impoverished brother who has become overwhelmingly successful and wants to be head of the family. Maneuvering in such waters makes Odysseus’ passage between Scylla and Charybdis look like a walk in the park. So much for theory. But what has happened in practice? North Korea under Kim Jong Un has been developing in promising ways on the domestic front. As early as December 2011, even before his formal ascension to power, Kim pledged to take care of the material wellbeing of his people in typical paternalistic fashion. In the first months of his rule, the new leader was much more active than expected. He publicly scolded officials at the Mangyŏngdae fun fair for not serving the people well; policy failures were characterized as mismanagement. This new populism found further expression in public speeches, close physical contact with his subjects during guidance visits, the quick admission of failures such as the rocket launch in April 2012, and not least the appearance of a First Lady, a novelty on the North Korean political scene. The new Kim-backed Moranbong Band, while not quite K-pop, enjoys star status. Admittedly, it is hard to fully grasp the meaning of some events, such as a bizarre Disney performance in July 2012 or a visit by former NBA star Dennis Rodman in February 2013; perhaps these are best understood as a local variant on the “bread and circuses” appeasement strategy that the ancient Roman poet Juvenal lamented. In addition to this, we could observe a remarkable dynamic in the top leadership. Vice Marshal Ri Yong Ho, a rising star since the party conference in September 2010, saw a quick end to his career. So did the Minister of Armed Forces, bringing the number of holders of this post to three in just 17 months. At the same time, top-level officials such as politburo members Kim Yong Nam, Choe Ryong Hae and Premier Choe Yong Rim were allowed to have a larger-than-usual amount of media attention, almost creating the impression of a mild form of collective leadership. But premier Choe, meanwhile, has been replaced, in what we can interpret as yet another show of power: no member of the elite should take his position for granted. The fact that economic pragmatist Pak Pong Ju is back as premier and new leader of the Cabinet is a hopeful sign. The population has noticed these developments. During a visit in April 2012, I felt that North Koreans seemed to be somewhat tense and edgy, unsure about what would happen under the new leader and torn between hope and concern. By September that year, the atmosphere had become almost upbeat and optimistic. This impression had not changed during my May 2013 visit, despite the lean season and the propaganda showdown with the West just weeks earlier. I also noted a growing number of short haircuts among women, particularly in Pyongyang, resembling the modern style of the First Lady and what I take to be growing self-confidence among individuals. Between my two visits in 2012, the number of booths selling bread, soda, pingsu (ice water) and cigarettes had multiplied; they could be found at almost every intersection in Pyongyang, in provincial cities and in the countryside. In addition, they had become more sophisticated. By May this year, I noticed the next step in an upgrading of commercial activities. In the capital, many of the once-freestanding booths are now integrated into regular buildings. On the main streets, there are signs for siktang (restaurant) and sangjŏm (usually a combination of shop, restaurant and service facility such as a sauna) almost every 50 meters. In provincial cities and the countryside, the booths still dominate; but there, too, the number of permanent and sophisticated commercial facilities is on the rise. Moreover, a sense of competition has emerged. Companies owned by the state, military and co-operatives proudly display their brand names on new, gold-bronze painted signs. The red-blue stickers on entrance doors indicate that Narae Card, a local cash card, is accepted. Never mind the mostly patriotic names, both clients and patrons in North Korea have obviously developed a sense for brands including and beyond big local names such as Mongnan Video or Pyŏnghwa Cars. There are more products on display and sale, and there are more customers with money. Pyongyang is taking the lead, but cities like Namp’o, Sariwŏn and Kaesŏng are following suit. Prices are often horrendous; three kilograms of apples cost as much as one (official) month’s wages. But the fact that even exotic goods such as bananas are being sold is remarkable. The challenge for a growing number of people does not seem to be access to goods and services any more, as was the case in the past and in most classical socialist economies. What counts now is having the right amount of the right currency, much as it is in the West. This is hard enough for many, to be sure, but it reflects a further normalization of economic affairs, at least on the individual level. The state and the people of North Korea are learning how to deal with the effects of marketization and monetization. After decades of being divided into a population of a small and mostly invisible elite and everyone else, a middle class of about 2 million people is on the rise. These are the people who have mobile phones, use taxis and show a remarkable diversity in clothing and accessories. The local 7-inch tablet computer, “Samjiyŏn,” sells for $180 and comes with the Android operating system and a number of apps such as a dictionary, changgi (Korean chess), and a collection of the works of the two deceased former leaders, Kim Il Sung and Kim Jong Il. Inline skating has been a hot trend among kids in the capital and has now spread to the countryside. In May, for the first time I saw a 16-year-old boy in blue jeans, and we could have a chat that was not prearranged. Restaurants sold opulent meals to customers who were so well nourished that they left slices of beef on the plate. Others enjoyed a day at a spa in a Pyongyang hotel, all paid for in hard currency. Museums and other places, including the Grand People’s Study House, now inevitably have shops. You can buy a small brush painting by Chŏng Chang Mo, one of the country’s leading artists, for 1,400 euro at the Kaesŏng stamp shop. Those who find carrying thick bundles of money in their pockets uncomfortable can use one of the two cash cards, the red-blue Narae issued by the Foreign Trade Bank and the golden Koryŏ issued by Koryŏ Bank, in taxis and a growing number of shops. The number of traffic lights replacing the iconic “Flowers of Pyongyang” (aka traffic ladies) has increased further, and small traffic jams are frequent. The highways are still empty but streets in the capital are now dominated by a great variety of modern passenger cars manufactured both at home and abroad. The number of yellow license plates, indicating “private” ownership, is increasing. The old trolley buses, some of which have run millions of kilometers — just count the red stars painted on their sides, one for each 50,000 kilometers — are being replaced by new ones, manufactured in Pyongyang. The quality of life in the capital differs significantly from the rest of the country. Some observers believe this will increase discontent; I would say it smartly diverts attention away from the shiny examples of foreign metropolises spread on pirated DVDs and USB sticks, and offers the population a domestic Xanadu. The key question for social stability is thus not what country bumpkins dream about, but what middle-class Pyongyangites aspire to. Meanwhile, the number of solar panels and small windmills is rising, which is the countryside’s solution to having less privileged access to power. On the ideological side, I noted an ongoing renovation and toning down of slogans and monuments. A novelty that I first encountered in September 2012 could be confirmed on my latest trip: less demonstrative, or in the words of a North Korean, more “natural-looking” slogans that are hardly readable from more than 100 meters away. I found an estimated 50-plus such slogans in Pyongyang alone. In addition, my impression is that the overall number of slogans and posters has decreased. Certainly there are enough of them left, many still in the typical flamboyant red-and-white motif, but it seems that the new leader wants to impress his people more by his deeds and not only by words. This did not prevent him from issuing the first badges with his own image, although I saw them only once in the Pyongyang metro. Despite all the changes, many of the old problems remain unsolved. Prices rise, speculation is rampant and frustration grows in sync with corruption and an ever-more obvious gap between the poor and the new middle class. It would be unrealistic to imply that Kim Jong Un even theoretically had the chance to improve the lives of the majority of his people significantly within a year of taking over. But he has not been idle. 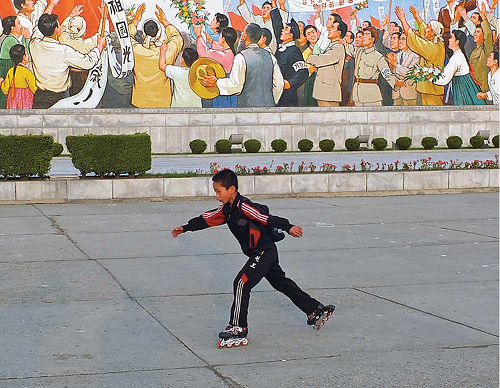 Inequality in North Korea is a sign of deepening change. A growing income and welfare gap between individuals indicates that the economy is on the move away from socialist egalitarianism towards capitalist diversity. In many ways, the state seems more relaxed. Imagine the excitement of my fellow foreign travelers in May when they started receiving text messages from home on their iPhones while standing in front of the Kim Il Sung statue in the border town of Kaesŏng. (The networks of the South’s Korea Telecom and SK Telecom made this possible.) Our minders did not even care. The stage has been set; expectations have been created. Now comes the tough part: finding ways to foster economic development while maintaining the stability of the political system. Reform is the only option for Kim Jong Un, but implementation will not be easy, because he must accomplish many tasks simultaneously. The countryside and the poor must trust in future improvements; the middle class in the capital must be given assurances of continued upward mobility; and the top elite must feel safe about its privileges without becoming too confident. North Korea needs the world market to increase income from trade and to reduce dependence on China. But without consent from the United States, this is an elusive hope as long as Washington demands an end to the nuclear program, a precondition that it is impossible for Kim Jong Un to accept. The recent use by North Korea of the Kaesŏng Industrial Zone to put pressure on South Korea might have worked, but it made it even harder to win the confidence of investors and trading partners, a key component of an export-oriented modernization strategy. The recent row with the US and threats of a nuclear war have not helped either, although I would argue that Kim Jong Un merely wanted to reinforce his position domestically and internationally before embarking on risky reforms. But in truth, we understand too little about the internal dynamics and decision-making process of the North Korean leadership to be sure about this. Kim Jong Un cannot simply escape the legacy of the past. He must consider the interests of various groups in multiple power centers. Like painting a masterpiece, reforming North Korea may seem easy in theory but it will be highly complex in reality. Thus, a smart policy by the international community is needed. The obvious strategy for Seoul would be to support positive trends by expanding trade and investment. The many negative and frustrating experiences of the past should be a lesson not to expect (or promise) too much too soon. Transforming a systemically failed socialist economy has never been easy, in particular if it is supposed to take place gradually. Reconciling two parts of a nation that once fought a bloody civil war and have lived separately for almost 70 years is a gigantic task. Accepting that successful reform means prolonging the current regime is a bitter pill for many, but what are the alternatives? Enjoyed this article very much… I am fascinated and now find myself slightly optimistic about the DPRK and reform. Visited there last month, and was positively surprised on many levels. Cheers.